“There is nothing on this earth more to be prized than true Friendship” – St Thomas Aquinas. The final leg in the model of Success is Friendship. When looking at the components of True Friendship we see a Bond between people that go beyond the surface. There is Loyalty, Respect, Encouragement and they Stand By You. It is completely Other Focus. GO BIG: Create the Bonds of Friendship. 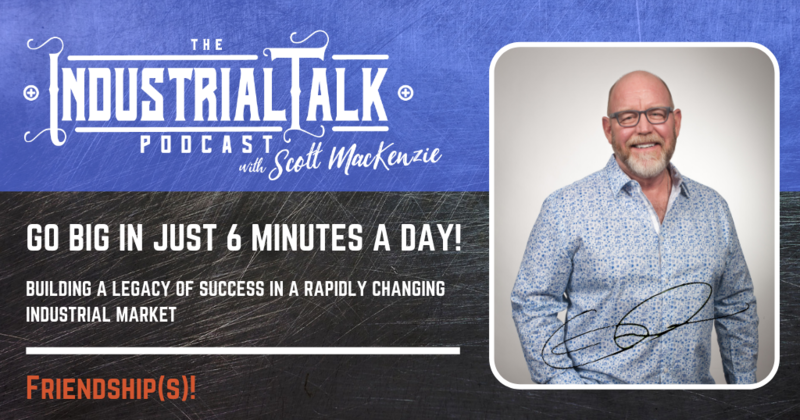 [00:01] The industrial talk podcast go big in just 6 minutes a day, building a legacy of success in a rapidly changing industrial markets. All right. Welcome to the industrial talk podcast. My name is Scott MacKenzie, so glad that you are here. Let's make this a great day. Let's get started with going big right. I'll make this quick. Absolutely quick. [00:24] We've been building. We've been building the the, the, the equation of success, right? We're talking about know, like and trust. We're talking about carrying. That was yesterday and we're now. We're going to be talking a little bit about friendship and what that means, right? Ideally, right? You take this component, these components, and with a solid concrete purpose, aim declaration. It's a powerful tool. It's, it's truly a powerful tool and once again, I'm gonna remind you if they don't know you, they're not gonna, they're not gonna buy anything from you. They don't like you. They're not going to buy anything from you. They'll trust you. They're not gonna buy anything from you, and if they know that you have really mean, your goal is to sell them, whatever that widget is or whatever, you don't have their best interest at heart. If you don't care for them and their success, they're not going to buy anything from you. [01:28] And then finally, finally, I think the one of the most powerful components associated with this particular equation as a friendship, you know that you have friends out there, there's a special bond with those individuals. There might be a significant history. So I have friends that through the power of digital media, social platforms, all of that, we're still friends. We still have that special bond that comes with time, history, laughter, you know, situations and there's nothing that will break that apart. And so we're going to talk a little bit about that. We're going to talk about the necessity for being able to create that friendship. So I'm going to start out with just a simple statement of simple quote here. There is nothing on this earth, nothing on this earth, more to be prized than true friendship. You're right. Now, of course we're going to have to define true friendship, but I just loved the way that that it's a prize. [02:32] It's special. It is. It's like Christmas time when you're out there and you go, man, there's a. there's a special present right there, and you open it up into my gosh, that is, that's what friendships all about. And you create that type of friendship with, with your customer base because you truly care from your heart. You want to develop that bond. So let's talk a little bit about what true friendship means. So when you, when you put this into action, right? First off, there's a bond. So think about your friends. You think about what they represent, how you can continue to interact with them and communicate with them. There might be good times, bad times, whatever, but there's this understanding there's a special bond. So I look at true friendships with a bond there, a there. There's also loyalty associated with that friendship. It's, it's wonderful to have that feeling no matter how you know, you mess up, we all mess up, we get knocked down, we have to get back up. [03:30] But it's always nice to know that, that your friends are true. Friends want to be able to pick you back up and come on, keep going, man. You're just. There's no room to quit here. Loyalty, you're loyal to your friends, they're loyal to you. There is a special loyalty that exist. So we got bonds, we got loyalty. There's a level of respect. No matter what. Like I said, man, we all make bad decisions. Sometimes we all go astray. But a real true friend is always there saying, I knew you'd come back. I'm here for you. So that there's a general level of respect, respect for your humanness. And that's what we're all about. They include you. So when something happens, something, there's exciting, some problems, challenge, whatever it might be. Their first thought or second thought, or even third thought is saying, Hey, I got to get a hold of Scott. [05:58] we got the know, like, and trust. We got carrie got a powerful equation. We're going to wrap that up tomorrow. We're going to wrap it up, but we're going to talk a little bit about purpose because all of that is all great, wonderful and Dandy, but you better define that purpose, that noble thing that sits within your heart that says, man, I love this and I'm going to continue to do it because it's important that I help other people within the industrial world to be successful. We don't complain here. This is a no complaint zone, right? We're all about action. We're all about service. We're all about helping the other pitcher. Hey man, we got some more coming to you. Thank you once again for joining the industrial talk podcast. Scott MacKenzie. So glad that you stay safe.